Kent M. Swig accompanied five other local experts last week in a panel discussion entitled “Whither Wall Street” that reviewed the past, present and future of Wall Street. The discussion was sponsored by the Skyscaper Museum, and took place at the Museum of American Finance, located in 48 Wall Street, a Swig Equities owned and manage property. In his remarks addressing the FiDi (Financial District) market place post 9/11, Swig stated “All of the goodness is still here”. He continued to discuss the neighborhood reputation for excellent education, high income, public transportation accessibility, retail and residential development, among other topics. Read more about Kent Swig’s participation on the Whither Wall Street panel at the Museum of American Finance. NEW YORK – October 14, 2010 – Swig Equities is pleased to announce that it has signed a new lease with Faunus Group International (FGI) at 80 Broad Street, a 400,000 square foot commercial office building located in the heart of Manhattan’s FiDi (Financial District) neighborhood. The lease represents both a lease renewal and space expansion for the headquarters of FGI. “We are thrilled with the confidence shown in 80 Broad and Swig Equities by FGI. We welcome its continued and expanded presence within our building,” said Kent M. Swig, President, Swig Equities. Jamie Drummond, Steven Jaray and Sheena Gohil of Colliers International represented FGI in its expansion and lease extension. FGI previously occupied a 6,600 square feet portion of the 22nd floor and has now expanded to the entire 22nd and 34th floors for a total of over 18,000 square feet for an 11-year term. Todd E. Korren of Swig Equities represented the landlord. 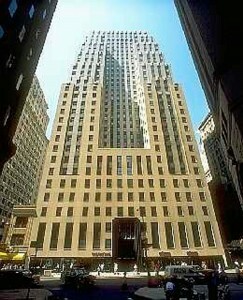 80 Broad Street, built in 1930 and designed by architects Sloan & Robertson, is a 36-story 400,000 square foot, recently renovated, first class office building. The property is free standing with windows on all four sides offering abundant light, air and unobstructed views from the tower floors. “Both tenants and brokers recognize our esteemed reputation for providing excellent customer service and trust. The 80 Broad Street exterior, lobby and operating systems have all been modernized and the building remains a value to tenants while also maintaining its historic pre-war design, which we believe appeals to many tenants,” said Todd E. Korren, Senior Vice President and Director of Leasing and Operations for Swig Equities. Currently, some of the major tenants at 80 Broad include: Vera Institute of Justice, McGivney & Kluger, P.C., Moed deArmas & Shannon, Aegis Communications Group, Inc., First Republic Bank and Vincenti & Vincenti.